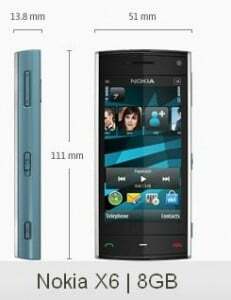 Worlds largest mobile handset giant Nokia today announced the launch of 3G enabled Music Flagship phone, the Nokia X6 8GB at Rs.14,199 in Indian market. 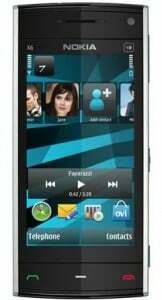 The Nokia X6-8GB is a powerful entertainment device capable of playing up to 35 hours of music, offering 8GB of on-board memory and supporting all main digital music formats, with a slick 3.2″ finger touch interface having a resolution of 360 x640 pixels and runs on Symbian s60 version 5. The display will be of capacitive type as in the earlier handsets. It comes with 5 mega pixel camera with Carl Zeiss lens with 4x digital zoom,auto focus and dual LED flash. Nokia X6-8GB comes with brilliant connectivity options as it supports GPRS, EDGE, 3G-HSDPA speed up to 3.6 Mbps WiFi, Bluetooth and microUSB services. 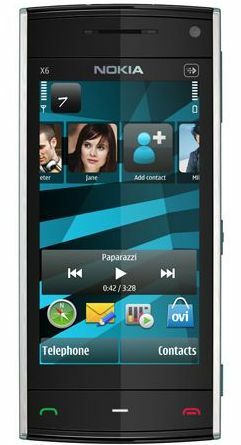 The handset will thrill its users with its musical capabilities including stereo speakers and 3.5 mm audio jack. It comes with Li-Ion 1320 mAh battery which claims to provide up to 12 hours of talk time in 2G/2.75G GSM network and 6 hours of talk time under 3G/UMTS network. The ultimate touch screen for text input and user interface control with alphanumeric keypad and on-screen QWERTY that are automatically changed with display rotation. The device also amazing for social butterflies, the Nokia X6 has a 16:9 widescreen optimized for photos, videos and browsing. The Nokia X6 is a hive of activity that brings friends and virtual communities, like Facebook, to the home screen, making it easy to socialize with friends and follow all the favorite blogs and celebrity’s on line gossips. In addition to the Unlimited Free access to millions of tracks available in Nokia Ovi Music Store,wherein users will be able to download exclusive content directly to their device or PC from both, international superstars and favorite local artists. Fans will have access to bonus tracks, remixes and other additional content, free of charge as part of the Comes With Music subscription. Nokia X6-8GB embedded with 3 games, Spore by EA, Asphalt4 and DJ Mix Tour by Gameloft, and direct access from the home screen to download more games and applications through the Ovi store the Ovi Store. look nice but costly, wait for few days cost will be reduced by Nokia to stay alive in competition with Samsung. 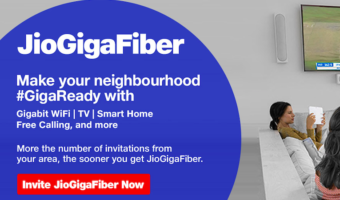 They knows now subscribers are moving towards Samsung for best value for money.